Bette's Place. 416 Oak Street, Hood River, OR 97031. Phone: 541-386-1880. Charburger Country. 4100 Westcliff Drive, Hood River, OR 97031. Phone: 541-386-3101. Cornerstone Cuisine. Hood River Hotel - 102 Oak Street, Hood River, OR 97031. Phone: 541-386-1900. Mesquitery Restaurant & The Shed Bar. 1219 12th Street, Hood River, OR 97031. Phone: 541-386-2002; The Shed: 541-387-4002; Fax: 541-386-2215. Mother's Market Place. 106 Highway 35, Hood River, OR 97031. Phone: 541-387-2202. New York City Sub Shop. 1020B Wasco Street, Hood River, OR 97031. Phone: 541-386-5144; Fax: 541-386-5717. North Oak Brasserie. 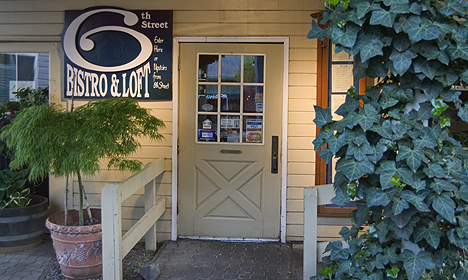 113 Third Street, Hood River, OR 97031. Riverside. Best Western Hood River Inn - 1108 E. Marina Way, Hood River, OR 97031. Phone: 541-386-4410. Sage's Café & Coffeehouse. 202 Cascade Street, Hood River, OR 97031. Phone: 386-9404. Shari's. 1803 12th Street, Hood River, OR 97031. Phone: 541-386-3394. Simon's Cliff House. Columbia Gorge Hotel - 4000 Westcliff Drive, Hood River, OR 97031. Phone: 541-386-5566. South Bank Kitchen. 404 Oak Street, Hood River, OR 97031. Phone: 541-386-9876. Stonehedge Gardens. 3405 Cascade Avenue, Hood River, OR 97031. Phone: 386-3940. Mt. Hood Railroad. Toll-free: 1-800-872-4661.